Police are looking for a 33-year-old convicted burglar who left HMP Ford and has not returned. James Cable left HMP Ford on October 21, police confirmed. A police spokesman said: “Cable is serving four years for offences committed in the Arun district. 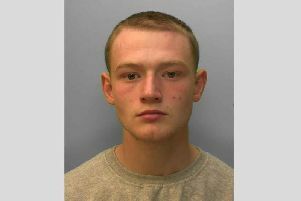 He is local to Bognor Regis, Littlehampton and Worthing and police believe he may still be in the area. “He is white, 5ft 10in, of medium build with very short brown hair. He has numerous tattoos, but the most notable one is that of the name ‘Laura’ on his neck. PC Lewis Dines said: “I think Cable probably hasn’t travelled far and I would urge anyone who has seen him or who knows of his whereabouts to contact us so that he can be returned to lawful custody. He is not considered dangerous, but if you do see him, please do not approach him, but dial 999 immediately. “If James is aware of this appeal, please go to your nearest police station and speak to officers there.